Games including card games, board games, roulette games, indoor games using small moving playing bodies, e.g. pinball games, miscellaneous games, e.g. puzzle games. Video games, i.e. games using an electronically generated display having two or more dimensions, e.g. on a television screen, showing representations related to the game. Any game using playing cards as the primary device with which the game is played. Playing cards used with card games; special shapes of playing cards used with card games or other games. Cards played in a game which is not a card game as such, i.e. in a game involving other primary playing supports than sole cards. Card games appurtenances and accessories for card games. Board games, i.e. any game in which counters or "playing pieces" are placed, removed, or moved on a generally premarked surface or "game board" according to a set of rules. Examples of board games: game of goose, chess, scrabble(R). Raffle games, i.e. any game in which people obtain tickets, each ticket having the chance of winning a prize, e.g. lottery games. Examples of raffle games: lottery, lotto, bingo. In a board game (A63F 3/00) the playing piece or counter is moved according to a set of rules (e.g. according to the face value of a dice), usually directly by the playing touching or handling the playing piece with the relevance put on the strategy, whereas in a game classified in A63F 7/00, the "moving playing body" is moving by itself, or moved by action of a physical force (gravity, projecting device, etc. ), with the relevance put on the movement itself. Generally, when playing pieces are rolling on a board, the right group is A63F 7/00. Generally, multiple classification is necessary: according to the type of game and according to the relevant technical characteristics. For example, a backgammon with illumination (DE202010009233U) is classified in both A63F 3/00151 and A63F 2003/00646. For trivia board games (aspects of a question-and-answer game), add the Indexing Code A63F 9/18. The board games are classified under A63F 3/00-A63F 3/04. The raffle games are classified under A63F 3/06-A63F 3/08. The type of board game is classified under A63F 3/00003, or in A63F 3/02 (chess-like board games) or A63F 3/04 (educational board games). 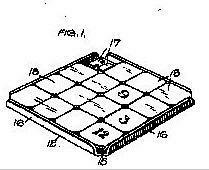 The mechanical characteristics of the game board of any game type are classified under A63F 3/00173. The playing pieces of any game type are classified under A63F 3/00697. The electrical features of any game type are classified under A63F 3/00643. The magnetic game boards of any type are classified in A63F 3/00694. 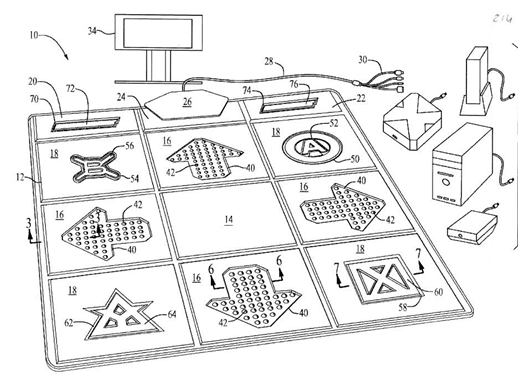 The accessories for game boards are classified under A63F 3/00895. Casino or betting board games and board games involving betting. Games for several participants, with game pieces and a throw able unit with plane faces carrying different symbols (dice), comprises a hollow component with a through hole and several blind holes. E.g. Game comprising a rectangular or cylindrical wooden box with a lid having five holes and one through hole. 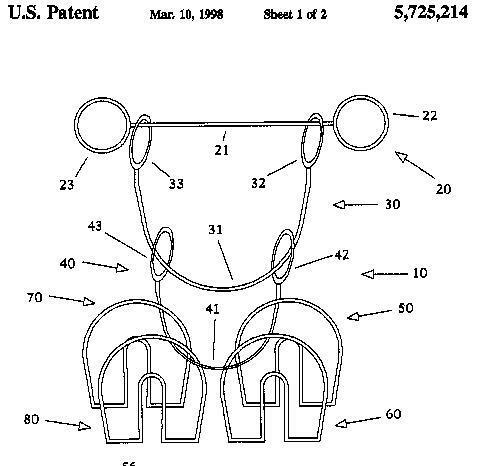 Popular in Germany, therefore principally from German patents. Possibly add Indexing Code A63F 2250/18 (Use of resilient or deformable elements) or A63F 2250/183 (Foam). For example the game "connect four". Electric features of any board game. Electric or electronic details not to be found under A63F 3/00643 can be classified under the Indexing Codes A63F 9/24. For example, aspects of radiofrequency identification (RFID) in board games are given the Indexing Code A63F 2009/2489. For example: inductive coils in the board, magnets in the playing pieces inducing signals in the coils.
" Hall effect (EN)", "Halleffekt", "Hall-Effekt", "Hallscher Effekt", "Hal'scher Effekt (D " and "effet Hall (FR "
electrical switch operated by an applied magnetic field. It consists of a pair of contacts on ferrous metal reeds in a hermetically sealed glass envelope. The contacts may be normally open, closing when a magnetic field is present, or normally closed and opening when a magnetic field is applied. 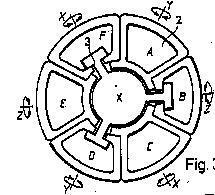 The switch may be actuated by a coil, making a reed relay - or by bringing a magnet near to the switch. Once the magnet is pulled away from the switch, the reed switch will go back to its original position. Board games having magnetic components. The board games having magnetic characteristics are not necessary all classified in A63F 3/00694. Only when the magnetic aspect is essential are these classifications given. A63F 2003/00662 and under for magnetic field sensors (with sub codes for "using inductance", "using hall effect" and "reed relay"). possibly (but more rarely) Indexing Code A63F 3/00694 when the magnetic aspect is not essential and does not concern any connection where another code is already existing. 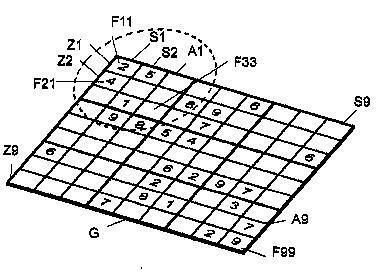 the " shogun"-type board games*, where the playing pieces comprise a changeable display by means of a (rotatable) magnet, are classified in the following group and Indexing Code in combination: A63F 2003/00826 and A63F 3/00694. (*The "shogun" game comprises particular playing pieces which could change the value marked thereon depending on the field where they were landing on. The mechanism was a rotating magnet in the playing piece and hidden magnets in the board. Examples: DE2718756, EP1813323, US3406974, DE202006017774U). Playing pieces for board games. Any accessory used in combination with a board game. Accessories specially adapted for board games for which a group exists in another place of the scheme (e.g. 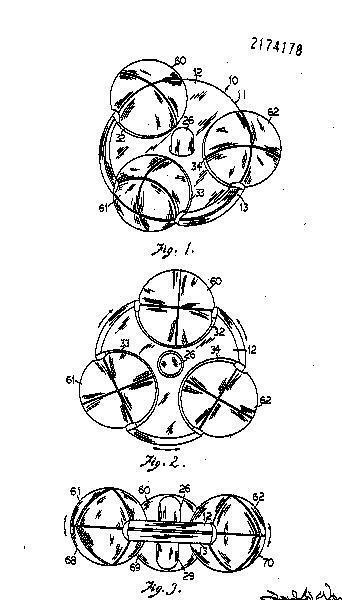 spinners, cf. limiting references) are given both the group A63F 3/00895 and the group of this other place. Any number board game comprising a grid of numbers, e.g. for playing 'Sudoku'-type games. Also: any logical board game equivalent to Sudoku, in which the numbers are replaced with other symbols, e.g. different colors. a figure composed of uniformly spaced horizontal and perpendicular lines. a puzzle in which several numbers are to be filled into a 9x9 grid of squares so that every row, every column, and every 3x3 box contains the numbers 1 through 9. Lottery games, bingo games, football pools and the like; Associated devices and accessories for playing or checking such games. A63F 3/0605-A63F 3/062 cover the type of game: Lottery games (A63F 3/0605), lottos (A63F 3/061), football pools (A63F 3/0615), bingo games (A63F 3/062). A63F 3/0625 and A63F 3/065 cover more precisely the devices for filling-in, checking, the tickets and accessories therefor. Balls for lottery apparatus: classified in A63F 9/0415 and Indexing Codes A63F 2009/0466 and A63F 3/061 . "Instant" lottery games, in which the ticket has a message becoming legible after an action of the player (e.g. scratch-off lottery games), are usually classified only in A63F 3/0665 - A63F 3/069 (with the ticket). A form of gambling games in which many people purchase chances, called lottery tickets. Generally the winning tickets are drawn from a pool composed of all tickets sold (sweepstakes) or offered for sale, or consisting of all of or most of the possible permutations of the numbers or symbols used on the tickets. The classic lotteries are with pre-printed numbers or symbols on the tickets.
" playslip", "grid" (EN) and " grille de loto" (FR) "
Lottery games in which the bettors can choose their own numbers (from an acceptable pool). In most lottos, the player fills out a playslip with his/her selected numbers. The playslip is then read on a terminal which records the selected numbers and generates a ticket. Lottery games based on outcome of a sporting event. Add Indexing Code A63F 2011/0097 if watching television is part of the game.
" football pool", "Pools", "forecasting/guessing results in competitions/sporting events/matches" (EN),"Toto, Sport Toto (D)" and "loto sportif, jeu de pronostics sportifs (FR)"
Bingo cards optionally include a free indicia that is considered a match in any pattern including said free indicia.
" bingo card game, Bingo, also sometimes called lotto (EN)" and " jeu de loto [le classique "loto des pompiers" avec quines et cartons pleins (FR) "
Tickets for lotto or bingo games referring to security aspects are allocated also the Indexing Code A63F 2250/58 "antifraud or preventing misuse". Holograms in lottery tickets: add Indexing Code A63F 2250/302. "lottery scratch tickets", "scratch-off tickets/layers ","removable layer" and "instance lottery games"
Fluorescence signature in lottery ticket: group A63F 3/0685 and Indexing Code A63F 2250/423. A form of gambling competition playable simultaneously by a large number of people, e.g. remotely playable via radio or Internet, in which people obtain numbered tickets, each ticket having the chance of winning a prize. Roulette games, that is any game of chance in which a rotating wheel or disc, the roulette wheel, determines the criteria for winning the game. Classical roulette games, that is games of chance where the landing position of a ball in pockets distributed around a rotating wheel determines the criteria for winning the game, are classified in A63F 5/00. Other roulette-like ball games, e.g. 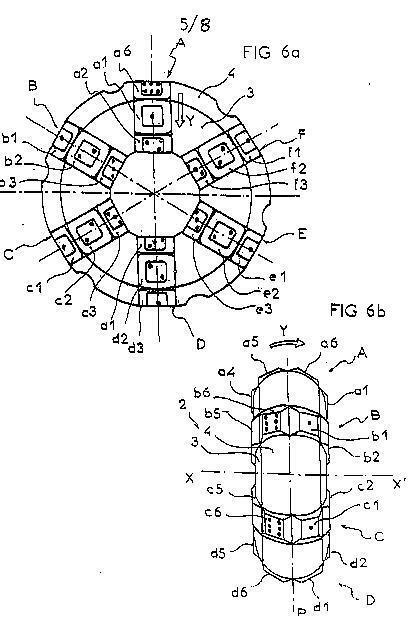 with holes distributed over the entire surface of the roulette wheel, are for A63F 5/02. Roulette games without ball are for A63F 5/04. Relevant details about the playing surface, the ball launcher, the ball itself, etc., not present in the classification scheme A63F 5/00 have to be classified in the scheme A63F 7/00. Relevant details about sensors, electronic displays, etc. have to be classified under Indexing Codes A63F 9/24. The groups A63F 5/0011 - A63F 5/0094 can be used in combination with any type of roulette games, that is also in combination with A63F 5/02 and A63F 5/04. The devices for launching the ball of a roulette game are classified both under A63F 7/24 and in A63F 5/00. The ball return mechanisms for roulette game are classified both in group A63F 5/00 and Indexing Code A63F 2007/345. 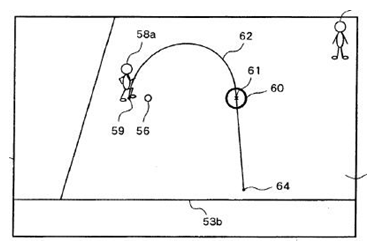 The devices using air jets for propelling the ball are classified both in A63F 2009/0087 and A63F 5/00. Roulette wheels in which the ball is automatically put in play. 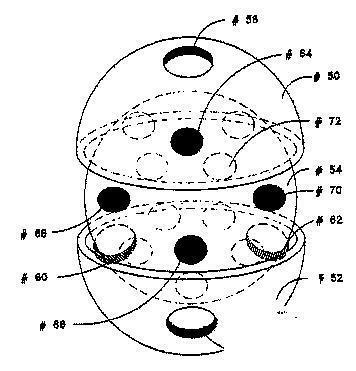 An automatic roulette wheel in which at the end of a turn the wheel is accelerated and the ball is ejected from the pocket under centrifugal force and moves to the top of the ball track. "Compartment", "(landing) sector", "pocket "and "canoe"
"carousel wheel", "spinning wheel", "dial (EN)" and "Wählscheibe (D)"
Any spinning top used as a die. A dice-top or teetotum has generally a polygonal body marked with letters or numbers, which indicate the result of each spin. The number of faces of the dice-top, when relevant, should be classified under Indexing Codes A63F 9/0415. 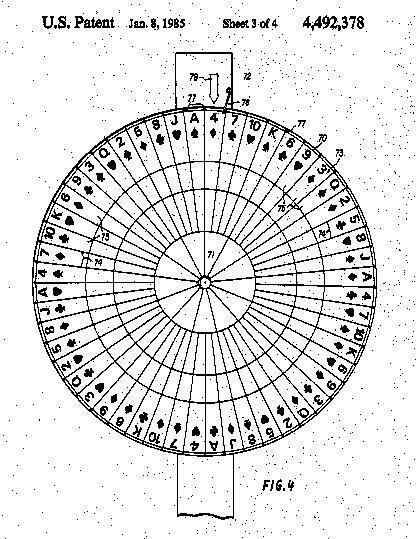 Fortune wheel, to be understood as using a rotating wheel with a fixed indicator (with optionally a friction stop). In a spinner (A63F 11/0011, Indexing Code A63F 2011/0016) a pointer rotates, possibly relatively to a fixed disc, whereas in a fortune wheel (A63F 5/045) a disc rotates relatively to a fixed pointer.
" Fortune wheel", "wheel of chance", "wheel of Fortune (EN)"," roue de la fortune(FR)" and " Glücksrad (DE)"
Any game in which the main purpose is to roll or move small playing bodies, e.g. balls, marbles, discs or blocks, with some skill on a playing surface or rolling board. Examples: Pinball games, marble games, tabletop football, rolling board games (ex. : US2009084863). In some cases the borderline between these games (A63F 7/00) and some sport games (A63B) with balls is blurred. The games of this group do not aim, contrary to the sport games, to do physical activity. Ball games in which players use a racket or wherein the ball bounces (like in table tennis games) are usually classified with the sport games (A63B). a modification of billiards played from one side in which the players' object is to strike the balls so that they, and perhaps other balls, shall fall into numbered holes or pockets that determine the score. Usually the bagatelle table has a rounded far end and a channel (essential) on the right hand side along which the balls are propelled and directed toward the pockets. The bagatelle requires the players standing at the square end of the table hitting the balls with a cue towards the holes at the other end. consist of marbles or balls that are shot onto a board which features areas fenced in by nails hammered into its surface. Each container scores different points depending upon the likelihood of a ball finishing in it (it is normally smaller than a bagatelle, table size). bagatelle (A63D 13/00), which is a modification of billiards played from one side in which the players' object is to strike the balls so that they, and perhaps other balls, shall fall into numbered holes or pockets that determine the score. Usually the bagatelle table has a rounded far end and a channel (essential) on the right hand side along which the balls are propelled and directed toward the pockets. The bagatelle requires the players standing at the square end of the table hitting the balls with a cue towards the holes at the other end. Children's bagatelle (also included in A63D 13/00) consist of marbles or balls that are shot onto a board which features areas fenced in by nails hammered into its surface. Each container scores different points depending upon the likelihood of a ball finishing in it (it is normally smaller than a bagatelle, table size). Pachinko or vertical pinball games. Games played on a non-stationary surface, e.g. 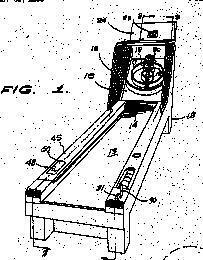 the ball intended to be in permanent motion, playing surfaces held by the user, mechanisms for rocking rolling boards during play. Balls or other moving playing bodies, e.g. pinballs, sliding discs, for use therefor. Accessories of general use for games covered in this subclass. Any game when the inventive idea consists in the combination or use of games or toys with another object which is usually not a game or a toy. The game or toy involved should be also classified in the corresponding group if available. 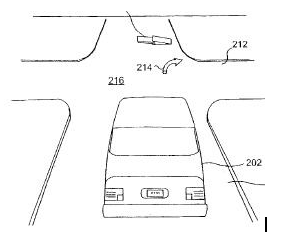 Examples: a beverage container system for playing a card game (US2003116914) is classified in A63F 9/001, Indexing Code A63F 2009/0012A63F 1/02. Boards or cards with holes containing concealed slips, disks or the like, to be punched out, used in various games: the slips or disks can bear numbers, names, prize designations, or the like. "cribbage board (EN)" and "planche de cribbage (FR)"
Any skill game involving propelling or causing to fall a projectile through the air at a target. do not have the purpose of training a weapon, like gun-aiming games. Games in which players throw a projectile by means of his hands, feet or a racket, and therefore involving a physical activity are usually classified with the sport games (A63B). Games in which players throw a projectile by means of a gun or other weapon are generally classified under F41. Games with integrated devices, e.g. with a spring -loaded launching device connected to a structure, are generally for A63F 9/02. 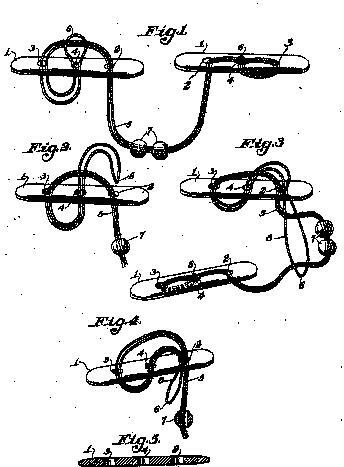 Accessories for use therewith, e.g. dice-boxes; mechanical dice-throwing devices, rolling boards for dice. Dice as such (the object itself) are found in A63F 9/0415 ("Details of dice"). Craps games, i.e. dice games involving betting, are placed in group A63F 3/00157 and the Indexing Code A63F 9/04. Rolling boards for rolling dice thereon. Details of rolling boards for dice can be classified under Indexing Codes A63F 7/36-A63F 2007/3666. Physical dice in which the random numbers are electronically generated. Usefull electronic details, e.g. emitters, sensors, classified under the Indexing Codes A63F 9/24. Dice games provided with instructions for playing the dice games, i.e. explaining how to proceed depending on the result of throwing the dice. Can take the shape of a instruction book, instruction card, table, etc. Any game using polaroid filters or polarised light. Puzzles provided with elements movable in relation, i.e. movably connected, to each other. Examples: sliding puzzles, Rubik's cubes. When the possible movement of the elements movable in relation occurs on a two-dimensional surface only, then classify in A63F 9/0803. When the movement occurs three-dimensionally, then classify A63F 9/0826.
" Brain twister", "brain-teaser", "logical puzzle (EN)", "Geduldspiel", "Denkspiel (DE)" and "casse-tête (FR)"
The 2D sliding puzzles or "slide puzzles" (with sliding elements on a plan, requiring vacant position or gap migration) are in A63F 9/0807. Typically, a series of generally rectangular tiles confined closely packed, side by side in coplanar relation as a generally two dimensional or planar array by a housing frame which also provides a vacant tile admitting or parking space so as to permit sequential lateral coplanar movement of selected individual tiles within the frame in and out of the parking space to change the array, typically to reorder indicia forming a sequence of numbers or letters marked on the exposed surface of the tiles or to change a pattern or picture depicted by the tiles.
" Sliding tile puzzle", "slide puzzle", "sliding puzzle", "sliding block puzzle", "shifting block puzzle (EN)", " Schiebespiel (DE)"and" taquin (FR)"
" gear game", "game with gears (EN)", and "jeu à engrenages (FR)"
Puzzles in which one or more of the elements are movable along plural intersecting circular paths. "mosaic puzzle" and "shunting puzzle"
Three-dimensional puzzles comprising a sphere inside another sphere, the spheres being rotatable with respect to each other. 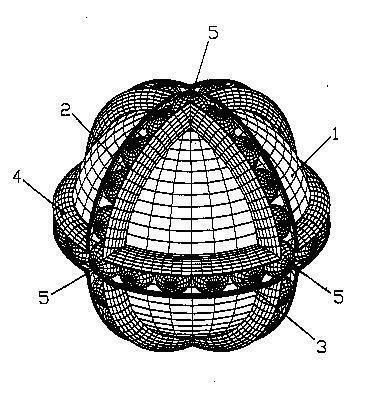 The spheres can be incomplete, e.g. with holes. Puzzles with bent wire or cord as primary element. "puzzle ring" and "wire puzzle"
Puzzles consisting of pieces that are to be fitted together to form a two-dimensional object, e.g. a picture. 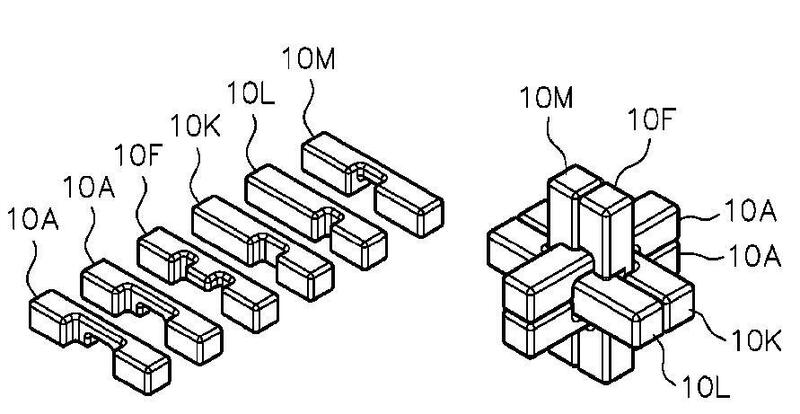 If the pieces are movably connected to each other, the main configuration remaining unchanged, e.g. sliding puzzles, then: A63F 9/08. The pieces of puzzles classified under A63F 9/08 are generally permanently connected to each other while playing, whereas the pieces of jigsaw puzzles are generally detached for one another when starting the game. 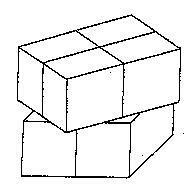 3D-puzzles, e.g. spherical puzzles, made from non-planar 2D-puzzle elements are classified in A63F 9/12 and A63F 2009/124 when the final configuration is a sphere). Shapes of jigsaw playing pieces can be classified under the Indexing Codes A63F 9/0669. Display boards as underlying support for putting the jigsaw puzzle playing pieces thereon or therein, while playing the jigsaw puzzle game, and/or for displaying the solution. Also therein: box for 2D jigsaw puzzles. Display on a pedestal or stand: add Indexing Code A63F 2009/0035. With provisions for hanging on a wall: add Indexing Code A63F 2009/0032. 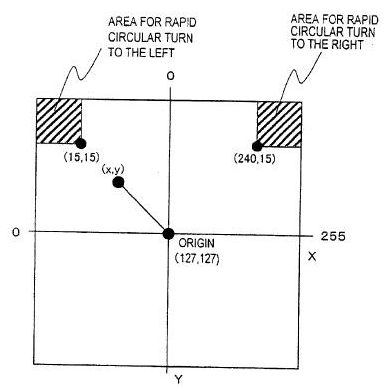 When rolling for storing, add also Indexing Code A63F 2003/00258 "rollable, flexible or deformable collapsible playboards for board games" (ex. : WO2008040824). 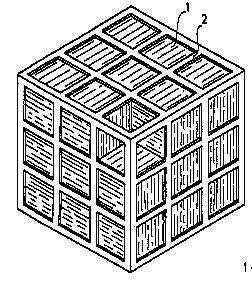 3D-puzzles, e.g. 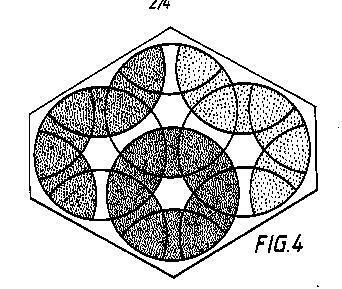 spherical puzzles, made from non-planar 2D-puzzle elements are classified under A63F 9/12 only, e.g. in A63F 9/12 and A63F 2009/124 when the final configuration is a sphere. Puzzles consisting of pieces that are to be fitted together to form a three-dimensional object. Jigsaw puzzles with foldable, bendable or hinged pieces. 3D as well as 2D foldable jigsaw puzzles are given this class. Add Indexing Code A63F 2003/00233 "collapsible playboard with one fold or hinge" or A63F 2003/00239 "with two hinges or folds" or A63F 2003/00246 "with three or more hinges or folds" when the resulting fold or hinge makes the whole puzzle foldable. When relevant add Indexing Code A63F 2250/18 "use of resilient or deformable elements" or A63F 2250/183 "foam". 3D-jigsaw puzzles using a plurality of pegs, pins or rods as puzzle elements (and not as e.g. 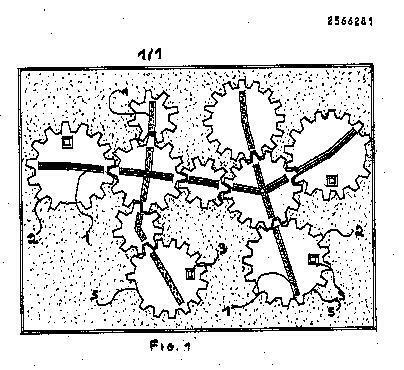 connectors or binding means between puzzle elements). The pegs can be of same or different types. Racing games, traffic games, and obstacle games characterised by figures moved by action of the player and comprising electric features, e.g. with electromotors for moving the figures. Tops involved in a game, games with tops (usually combined with a rolling board or involving a plurality of tops). 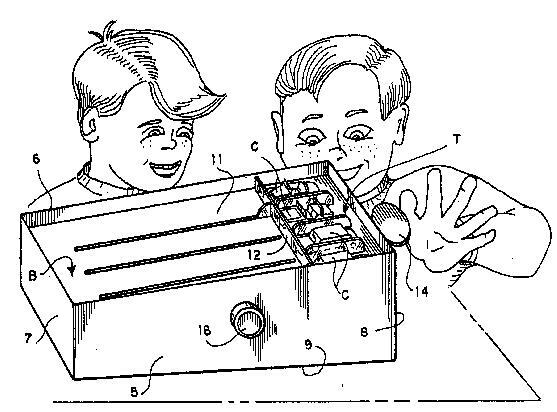 Electrically-operated teaching apparatus or devices working with questions and answers. TV quizz shows: add Indexing Code A63F 2250/64. Crane game machines (ex. US5855374, DE3526438) are classified in both A63F 9/30 and G07F 17/3297 . Game accessories of general use, e.g. bags for tokens, spinners, score counters, boxes. Game accessories specially adapted for a particular type of game are classified in one of the groups A63F 1/00 - A63F 9/00 covering the particular game. Game accessories for specific games, when notable as such: give classification group to the specific game and classification to the accessory. Game accessories for specific games, when notable only in combination with the specific game: give classification to the specific game and Indexing Code to the accessory. Chance selecting devices for games, e.g. spinners. In a spinner (A63F 11/0011 and subgroups, Indexing Code A63F 2011/0016) a pointer rotates (possibly relatively to a fixed disc) whereas in a fortune wheel (A63F 5/045) a disc rotates relative to a fixed pointer. Intruments, devices or parts of playing devices for calculating or indicating values, e.g. scores or coefficients. Any abacus as score counters, as calculator or the like function. For the slid bead frames were the game itself consists of sliding a bead over a wire, the key code is the Indexing Code: A63F 2007/4081 "ball with a hole sliding over a guide". is a particular bead frame with the aim of (score) count ing, calculating.Not to mix up with "abac": the abacs (french "abaques" or "abaques de calcul") are classified in Indexing Code A63F 2011/0067 "score or tally sheet".
" abacus", "abacuses", "abaci" (EN), "boulier (abaque)" (FR) and "Abakus (DE)"
Structural or hardware-related aspects of video games: accessories, optional for the execution of the game; constructional details of game devices; input devices specially adapted for playing video games; output devices specially adapted for playing video games. Details specific to network games: characteristics of the network topology when used in network games; details of servers specially adapted for providing network games. Software aspects of video games, played locally or in a network: the mapping of input signals into game commands; the animation of the virtual camera in a video game; indicators added to the game scene; time aspects of video games; simulation of game objects or characters; the generation or alteration of the game content; game management; the provision of additional services to game players. This group is an "application place" with respect to more functional places such as G06F, G06T or H04L. This group covers systems using computer and telecommunication technologies, which have been specially adapted for providing video games, as seen above. The scope of this group differs from that of G07F 17/32 which covers games providing financial rewards, played by electronic means, e.g. online poker, waging or betting. The scope of this group also differs from that of main groups A63F 1/00 - A63F 11/00 which cover traditional games such as puzzles and card, board and dice games, and from that of A63F 9/24 which covers traditional games played by electronic means. The scope of this group differs from that of A63H, which covers toys. This group covers features of input devices specially adapted to video games. The corresponding function place for generic computer input devices is G06F 3/01- G06F 3/03. This group is in particular an application place for computer graphics. Animation and 3D graphics in general are covered by G06T 13/00 - G06T 19/00. This group is an application place for telecommunication, in particular with respect to network games. Data network services are covered by H04L 29/06. coin-operated entertainment device placed in a public venue. a sequence of commands which has by design a greater effect when executed within a fixed time period than the mere succession of these commands. real object used in the field of view of an imaging system which appears in the image produced, for use as a point of reference or a measure; the object can exist naturally in the scene (features of a face) or be added for the purpose of tracking (light-emitting diode, retro-reflective patch). outputting forces, vibrations, and/or motions to the player to provide haptic feedback. a game entity simulating a sentient being; the simulated being can be real, e.g. a person or an animal, or fictitious, e.g. a dragon or a speaking mirror. game device connected to a game server through a network. game-specific representation of the control signal, e.g. "pause" or "shoot" command. 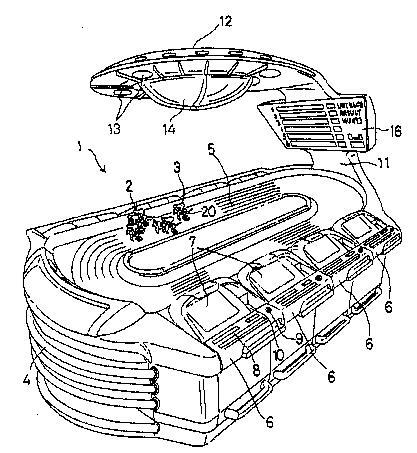 consumer electronics system specially adapted to execute video games, offering reduced functions with respect to generic personal computers; it differs from arcade machines, which are also specially adapted for video games, but for commercial purposes. data required for the execution of the game program, e.g. bitmap images, three-dimensional models; the content is usually created by the game makers before the game release, but can also created afterwards by the player, e.g. using level editors. 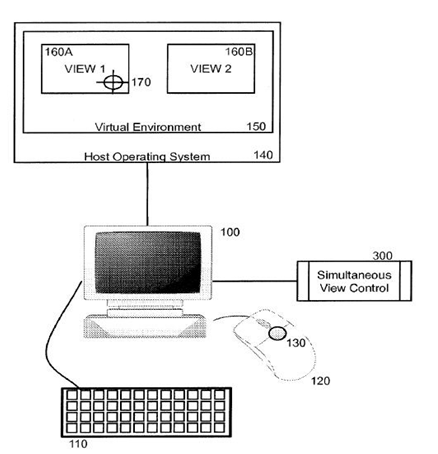 a data-processing apparatus enabling performing of the video game; the apparatus is connected to a display and input means, e.g. a controller or a mouse; it is either handheld or stationary; the device can be dedicated to the execution of game programs, e.g. a game console, an arcade game machine, a portable game machine, or a generic computer, e.g. a personal computer. abstract description of the game's inner workings and the possible interactions with the player, conditioning her tactical possibilities. The game model includes game parameters, such as the score, and the procedures and constraints governing their evolution. 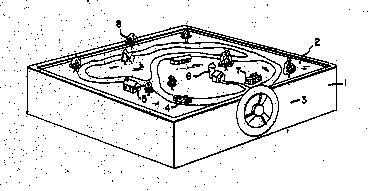 The game specification usually includes a model of some physical systems, be they fictitious or real. However, this model is not part of the game model if its sole purpose is to provide a realistic simulation. a game entity simulating a thing (excluding sentient beings); the simulated thing can be real, e.g. a tennis ball, or fictitious, e.g. a laser gun. a variable of the game model. Some variables of the game specification are not game parameters. 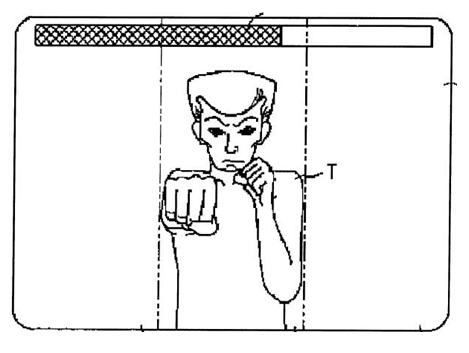 For instance, the position of the virtual camera in a hand-to-hand fighting game is a game parameter if the position is chosen to be closer to the fighter with the lowest life meter. On the contrary, calculating a natural position of a fighter's elbow using the positions and orientations of his hands and shoulders, does not belong to the game model. a computer readable program comprising instructions and data adapted to perform a video game when executed on a data-processing apparatus. To produce the video game program, the game designer communicates the game model in the game specifications to the developer team, who creates or adapts a game engine to implement the game model and optimize its implementation. data describing the main virtual space used in the game's representation, e.g. describing a maze, a race circuit or the room where the player character is located, and its content. By extension, the image resulting from processing this data. The structure used for this data is usually a scene graph. 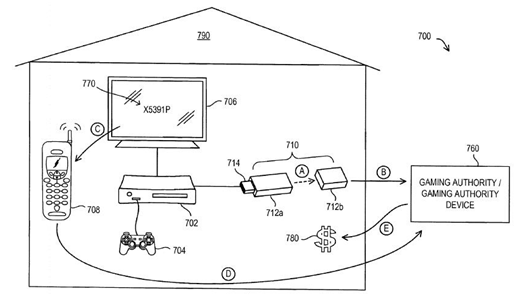 a data-processing apparatus or system connected to a network, not adapted for accepting directly player-generated signals, facilitating at least part of the execution of a video game (e.g. receiving inputs from the game clients, executing the game for the game clients and providing processed game information to the game clients for presentation to the player). an action made by the player to convey a decision, e.g. move circularly the arm, push a button with a finger. virtual viewpoint in world space with position and view direction to render an image of the game. core portion of the game program which masks the hardware platform and can be re-used when developing other game programs. The game engine components typically include a rendering engine, a physics engine, and frameworks for e.g. sound, scripting, animation, artificial intelligence, networking, streaming, memory management, threading, localization support, and scene graph management. a game providing challenges that can be completed in a number of different sequences. simulation of a 3D environment using 2D techniques, such as the axonometric projection, parallax scrolling or skyboxing. Only input devices, which have been specially adapted for playing games. Generic input devices such as a mouse which could also be used in a game are covered in the function place G06F 3/00. The use of commonplace sensors for unforeseen purposes, e.g. a pedal controlling the stand up/crouch position of a player-character, and devices using unforeseen sensors, e.g. electronic noses. The subgroups under this group cover the physical parameters to be sensed and the means of detection. Input devices sensing acceleration, angular acceleration, velocity, angular velocity, position or orientation. A typical setup includes 3 mono-dimensional accelerometers, arranged perpendicularly, where the measured acceleration values are integrated to compute velocity and further, the device's position. 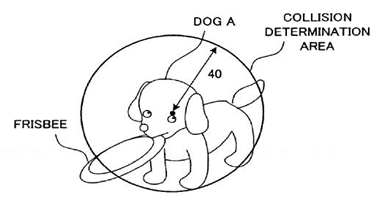 The inertial sensor can be included in the game controller. The sensor can simply detect the motion in a given direction, without providing a measure of its intensity, e.g. to detect a push. 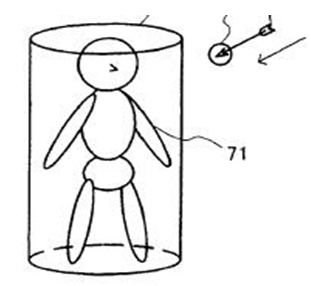 Wearable sensors which register a biosignal, such as electroencephalogram, or the motion of the player. Communication between the input device and the game device is usually wireless, but can be wired. Cameras and image sensors used in video games. Photo-detecting means, e.g. photodiodes or infrared detectors, included in the game controller. 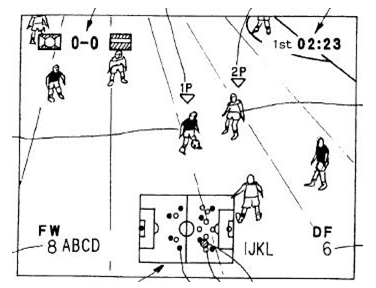 Typically, a camera is placed close to the main screen and registers the player's motions (see for example ref. 20 of the drawing). To ease tracking, fiducials such as objects with specific colours, shapes or reflectivity can be used. The output information is typically bi-dimensional. Alternatively, photodetecting means are included in the game controller and register the position of infrared light sources. Some imaging systems also provide depth information, using a range sensor, or using several cameras. 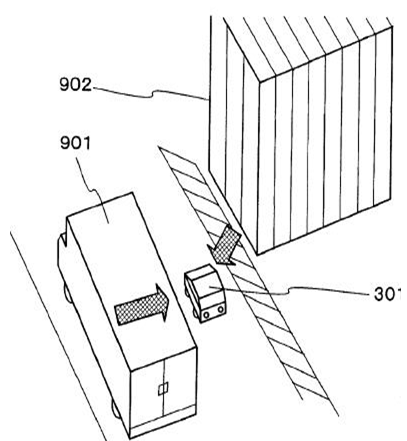 Sensors for detecting a variation of a physical quantity measured at a location on a surface. Devices using a plurality of discrete switches, e.g. dance mats. 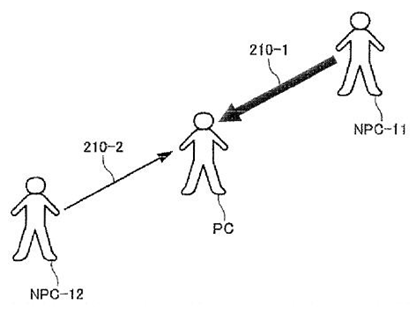 Detecting the location of player's fingers by non-contact methods, e.g. reflected light. Direct interactions with the game display. Typically, the screen and the sensor are provided in one form-factor. However, the display can be composed of a projector and a projecting surface, also used to detect contact. Sensors allowing the player to enter a voice command, to sing or to blow. Microphone arrays used for source localization are also classified here. Use of geographical information obtained directly, e.g. by GPS, or indirectly, e.g. by triangulation of cellular telephone base stations. Use of geographical information as a game input, or for a "treasure hunt", or as a game parameter, e.g. for matching the day/night cycle of the game to local time. Use of photo-sensing cells to detect scanning lines on a monitor screen and using synchronization information to calculate the scan line position at the time of detection. Use of photo-sensing cells to detect IR emitters placed nearby the display. Connectors specially adapted for video game input devices. 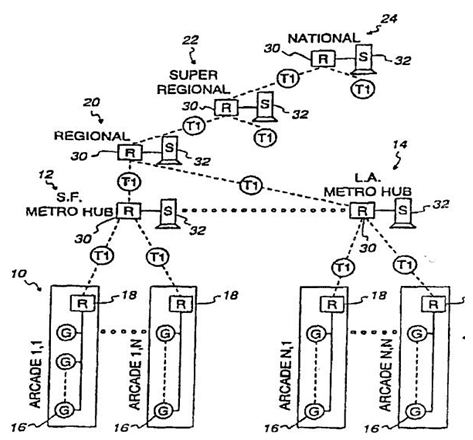 Methods to provide additional data on standard connection. Devices to allow more controllers than the number of ports on the game device. 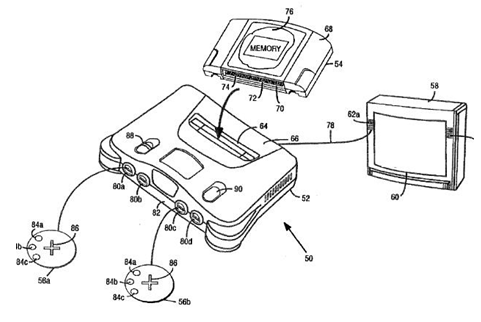 Arrangements to daisy-chain game controllers. Specific interface protocols, aspects regarding battery management, use of RFID and other wireless transponders for game data input. 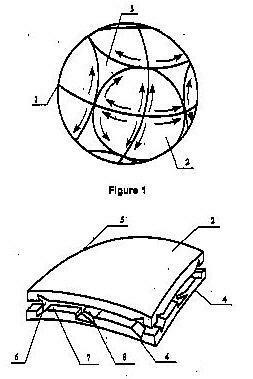 Construction of input devices having several mechanical degrees of freedom, for example allowing rotation or twisting. Details of mechanical contact between elements of game controller, e.g. sliding or rotating contact. Input devices mimicking real world objects, which are used in the game simulation such as steering wheels, pedals, throttles, guns, rifles, fishing rods, guitars, keyboards, drums. The type of game should be additionally classified under A63F 13/90. Game controllers with a small-size display device, allowing to display additional views of the game or player-specific information. Generating forces to give tactile feedback. Communication between handheld game devices and a home game devices. Communication between portable game devices and arcade machines. Typically, the game devices are designed by the same company, which simplifies the data exchange. However, this group also covers communications between game devices with different hardware characteristics executing different Operating Systems. 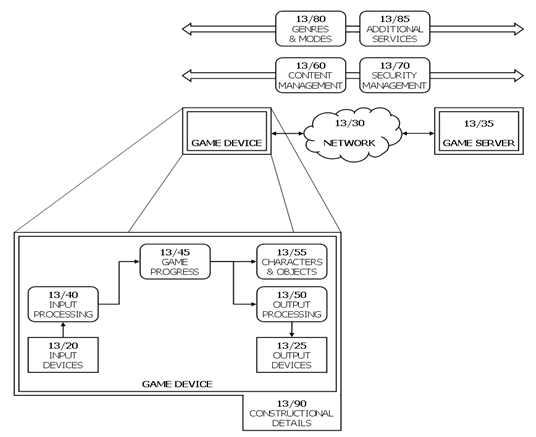 Arrangements for locally connecting game devices using an air interface. Connections based on standardized protocols are used such as IEEE 802.11 (WiFi) or Bluetooth. Connections based on game device specific protocols using for example the Infrared interface of hand-held devices. Arrangements of hierarchies of game servers and players. In the exemplary drawing below, references 10, 12, 14, 20, 22, 24 show the different layers in the server hierarchy with increasing geographical coverage. Aspects of the use of input signals for facilitating the game interaction process. Details of the generation of these signals, e.g. transduction from tactile or acoustic input, are classified in the corresponding function places. The linear mapping of input signals into game commands. The insertion of additional commands in the command sequence, i.e. to produce combos, and correcting the player's input to improve her accuracy. Non-trivial mappings to game scene (e.g. use of 2D position for pointing to a game object in 3D environment), sequences of operations (e.g. drawing the trajectory of a sword on screen) and their recognition (e.g. symbol drawn to cast spell). The processing of signals representing motion of the controller, e.g. 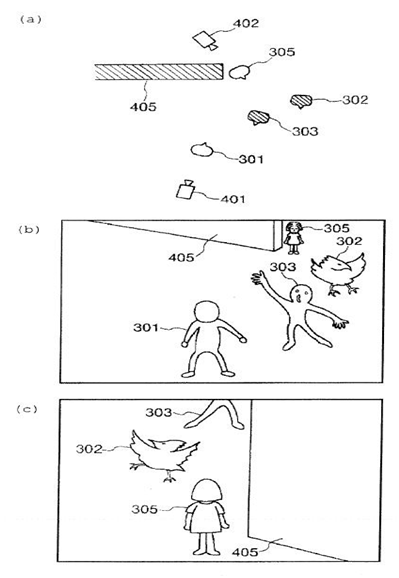 swinging, as detected by accelerometers, to produce game commands. The mapping of signals, e.g. from accelerometers, onto game object parameters. Detection and recognition of sequences of operation, e.g. rotating a controller such as a lever for 720 degrees. Evaluation of timing actions, e.g. in rhythm games, time-dependent sequences of commands, e.g. combos, and the displays associated to timing. In the exemplary drawing below, each time slot T1, T2, T3, T4 has subdivisions defining the optimal timing of an action. Details of scoring methods, such as fuzzy evaluations of score, management of experience points or rewards scheme. The control of the game's narrative. A narrative structure can be implemented trivially as a sequence, but also as a tree or as a set of goals or tasks randomly assigned to NPC, to provide nonlinear gameplay. The exemplary drawing below shows different branching points in the narrative (410,420,430) with the possible alternative segments. The storage of game data in internal or external memory. Both "save" and "pause" commands can be triggered by the player or automatically, e.g. pausing when receiving a phone call on the same device or auto-save feature. Typically, a multiplayer game played over a network requires a protocol to pause or end the game. For instance, a player closes her own handheld apparatus. 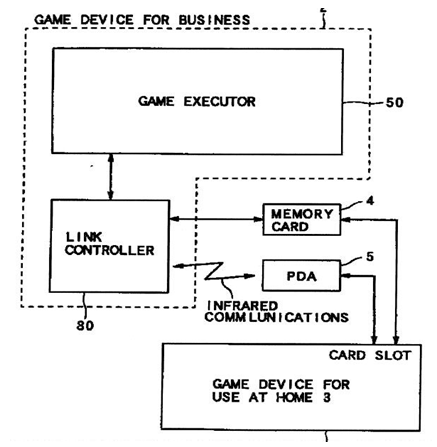 Prior to setting of a sleep mode, the game apparatus notifies all other game apparatuses of the interruption of the communication game, and then the game apparatus saves parameters necessary to execute a game main processing program to interrupt the execution of the game main processing program. Methods for compensating discontinuities in memory or input when resuming. For instance, if a game using a controller with a tilt sensor is paused, then the change of position during pause will cause a discontinuity in the input coordinates. Backward replay allowing the player to roll back to a previous state, e.g. before her character's death. Forward replay allowing to display past game events. Summary or recap techniques for shortening the replay. Aspects of the use of such signals for facilitating the game interaction process. Use of signals not directed to the screen or the speakers. 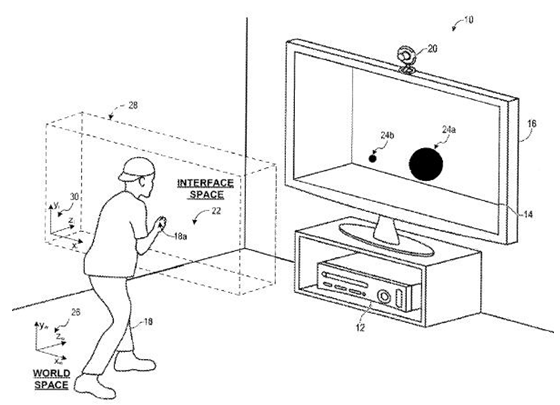 The control of virtual cameras to facilitate the interactions between the player and the game. The use of game variables for this control. For instance, in a fighting game, the camera can be placed closer to the fighter with the lowest life meter. Techniques that enable rendering of scenes from multiple perspectives. Direct control of the camera by the player to e.g. resolve projection ambiguities or occlusions. This control can be explicit, e.g. using a dedicated lever, or implicit. For instance, the orientation of the virtual camera can be set to the real orientation of a camera, to produce an augmented reality game. 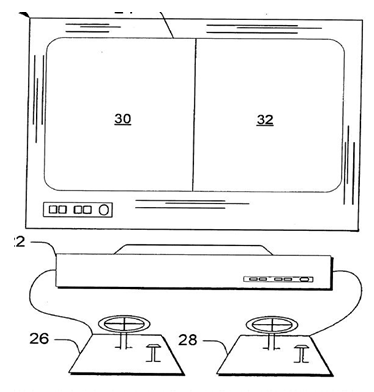 Alternatively, the head of the player can be tracked and the virtual viewpoint's position be updated accordingly, to produce an autostereoscopic display. 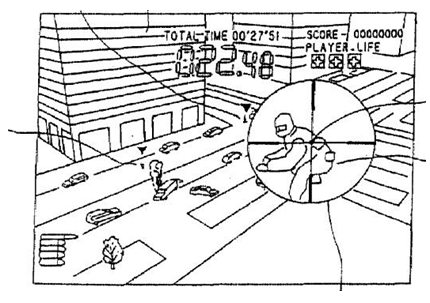 In the exemplary drawing below, the player can select view 160A or 160B using the input device 120. Methods for setting dynamical parameters of the virtual camera according to the dynamical parameters of a game object or character, allowing to implement cinematographic camera effects in video games. Typically, speeds will be similar but the virtual camera may accelerate or decelerate according to a predefined game event. The relative height or angle of the virtual camera provides also the desired view of the game scene. For example, if the player's car approaches an obstacle such as a tree or building, the viewpoint is positioned to quickly approach the player's car by increasing the moving speed. 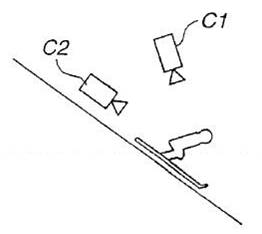 In the further exemplary drawing below, virtual camera C tracks the virtual skier and changes its height and direction between C1 and C2 according to the game course. The display of game state variables which are not expressed in the game scene or of information to improve the game-player interaction. 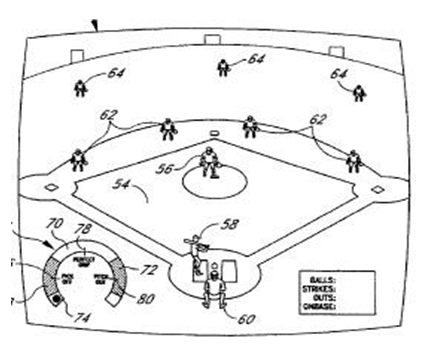 For instance, a magnified view of the target is displayed in a shooting game or a gauge for controlling the timing of the pitch in a baseball game. Methods for prompting the player by presenting a display of control buttons, a keyboard, a menu, or the like. Indicators related to the experience or health of characters, for example, power gauges and life indicators. Indicators used to show the current selection or the target for the next game command. The selection can be controlled by the player, or automatic, e.g. highlighting the closest team member in a soccer game. Techniques to help the player choosing her next command. Typically, a textual advice or a drawing of the game controller is overlaid. It is also used to provide information on a part of the game scene which is not visible on the screen, e.g. the position of the soccer team members on the field. Hints as part of an in-game tutorial. Indicators linked to an object in the scene. Overlaid windows with a two-dimensional map of the game scene. Sound effects in video games. In the first example below, sound characteristics are generated depending on the status of the car (idling, moving). In the second example, the reverberation from obstacles 901, 902 is be simulated. Methods for moving automatically non-player characters in the game scene according to the game progress. 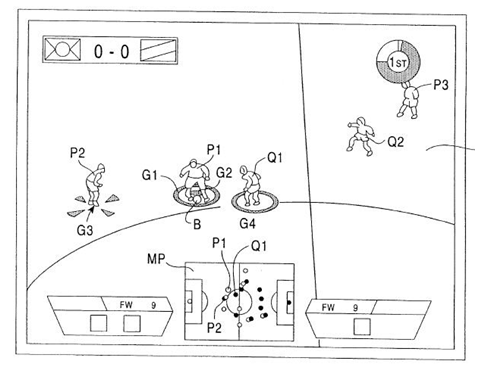 For example, virtual soldiers follow their leaders in a strategy games or virtual soccer characters are positioned to receive or intercept the ball. In the first example below, characters 51 and 52 are moving automatically to a location according to player input on a touch screen. In the other example, non-player characters 11 and 12 are approaching automatically the player character. In the example below, tyre load (front, rear, left or right) is computed according to the longitudinal or transversal acceleration of the virtual racing car and indicated by the shading. The impact of calculated trajectories on the game process. 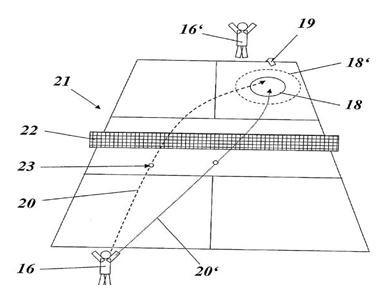 In the examples below, the trajectories of the tennis or soccer ball are used to determine the landing point on the game field. 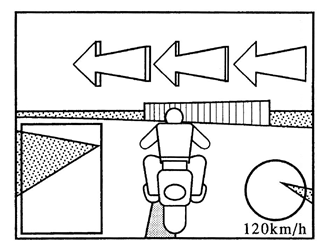 The determination if an object or character has entered the collision zone of other objects or characters. The triggering of a corresponding game action if collision has occurred. In the examples below, the results of collision determination are used to find out if the player character has broken a glass surface with a ball, has been hit by an arrow or could catch a flying object. The computation of parameters associated with game characters, which need to be continuously updated in the game course. The use of those parameters to influence the game course as they typically have a significant impact on the outcome of the game. 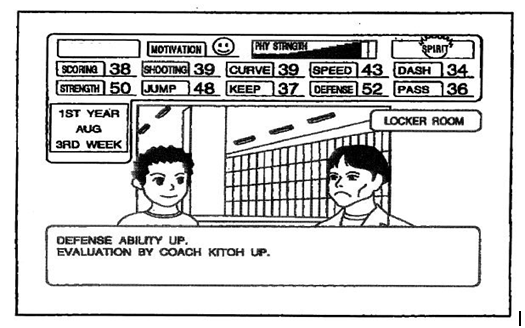 The dashboard of the exemplary drawing below shows the different skill parameters of a game character in a soccer video game. Techniques for embedding advertising information in video games. Techniques for associating advertising information to video games. In the example below, a virtual billboard displays an advertisement in a video racing game. Means allowing the player to create new game items, or to add music or a personalised sound track to the game. 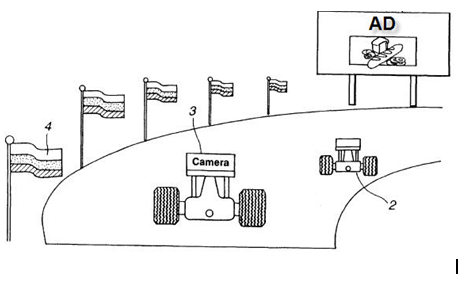 Collecting images and data from real world games, races, etc., and the processing and use of this information to create a virtual event, for example a race between a player's virtual car and real cars. Techniques for embedding photos in video games. Techniques for associating photos to video games. 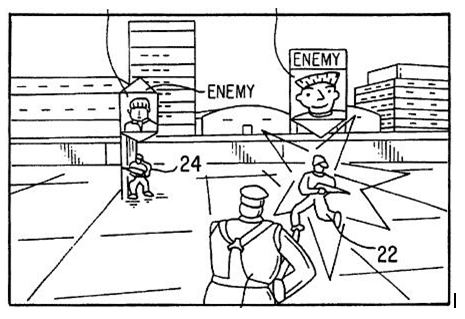 In the example below, photos of other players are used to tag enemy characters 22 and 24. Techniques restricting access to game information files, being stored locally or distributed via a network. In the example below, security devices 710 are entitled by a gaming authority 760 and provide conditional access to game device 702. The detection and classification of player's activity into foul play and the imposition of game penalties. Inviting players to multi-player games running on a network. Associating players with a group of players based on preferences. Using information from social network services in a game. Evaluating players and producing ranking lists in multi-player games running on a network. Techniques for providing multiplayer games on the same game device by offering each player her own input device. Typically, a different view is displayed for each character on a different output area of the display device if they are too far one from the other, and a single view is used when the characters are close enough. In the examples below, the screen is subdivided horizontally or vertically into two regions, allowing to render the game from the perspective of each of the two players. The use of peer-to-peer or one-to-many communications in multi-player games running on a network. Structural or electrical aspects of the game device hardware. 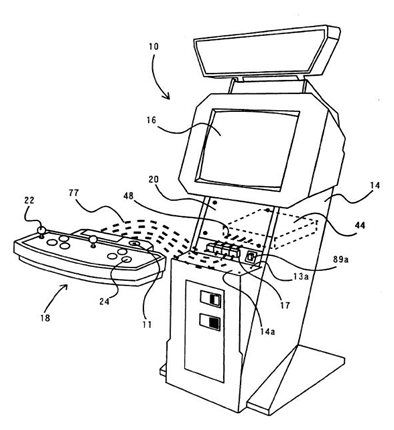 In the example below, an arcade machine has changeable input means, which can be fixed to the housing but later replaced if the type of game changes. Dedicated game devices, where the form factor, size, weight, button arrangements or compact design make them suitable to be held at least in a hand. Such devices depart from generic hand-held devices, such as PDA or mobile phones, which can run games but are not specially designed for playing. In the example below, a dedicated game cartridge storing a game program can be inserted into a game machine. Accessories, which are optional for playing the game (i.e. as opposed to input means, which are essential). They may add for example comfort or convenience to the game experience. In the examples below, accessories are used to support a hand-held game device or a game controller. Input arrangements for game devices. Covered are here only input devices, which have been specially adapted for playing games and are usually distinguished by their shape, the number or arrangement of buttons. 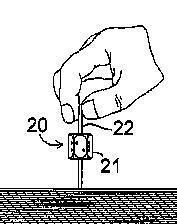 Generic input devices such as a mouse which could also be used in a game are covered in the function place G03F 3/00. Using sensors worn by the player, e.g. for measuring heart beat or leg activity. For examples of the subject matter covered by this Indexing Code, see US5672107, EP1275420, JP2003033572, JP11047445, JP7289734. Setup operations, e.g. calibration, key configuration or button assignment. For examples of the subject matter covered by this Indexing Code, see US2006116203, JP2006149927, JP2283390. For interfacing with the game device, e.g. specific interfaces between game controller and game console. For examples of the subject matter covered by this Indexing Code, see US6514143, US2001009564, JP2001147767, JP2001202168. For examples of the subject matter covered by this Indexing Code, see US2002098889, US2006111187, JP2002140154, JP2004329300. 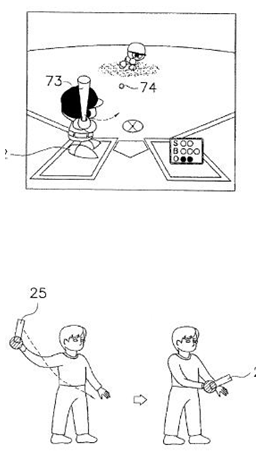 Generating tactile feedback signals via the game input device, e.g. force feedback. For examples of the subject matter covered by this Indexing Code, see US2006046843, US2007182708, JP2006068210, JP2005056267. Constructional details thereof, e.g. 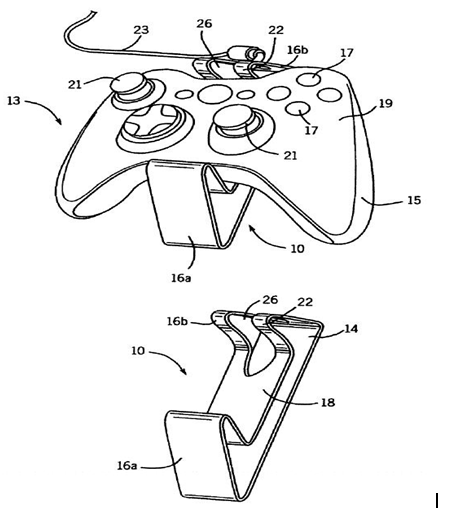 controllers with detachable joystick handles. For examples of the subject matter covered by this Indexing Code, see EP1586356, EP1475131, US2004142749, JP2005296432, JP2004329915, JP2004215856. For examples of the subject matter covered by this Indexing Code, see EP1062994, WO2004009196, JP2007296219. Using pressure sensors, e.g. generating a signal proportional to the pressure applied by the player. For examples of the subject matter covered by this Indexing Code, see US2007281787, US2004147317, JP2007299706, JP2004261193. Specially adapted to a particular type of game, e.g. steering wheels. For examples of the subject matter covered by this Indexing Code, see US5056787, US5813864, US6312335, JP2114982, JP9149957, JP10214155. For locating contacts on a surface, e.g. floor mats or touch pads. For examples of the subject matter covered by this Indexing Code, see US2007015588, JP2000293292, JP2007018372, JP2004337504. The surface being also a display device, e.g. touch screens. For examples of the subject matter covered by this Indexing Code, see US2005159223, US2006019752, JP2005204754, JP3734819B1. For detecting acoustic signals, e.g. using a microphone. Microphones allowing the player to enter a voice command for, e.g. providing additional control of his/her character. For examples of the subject matter covered by this Indexing Code, see US2007178952, JP2000181676, JP2002136764, JP2005103241. 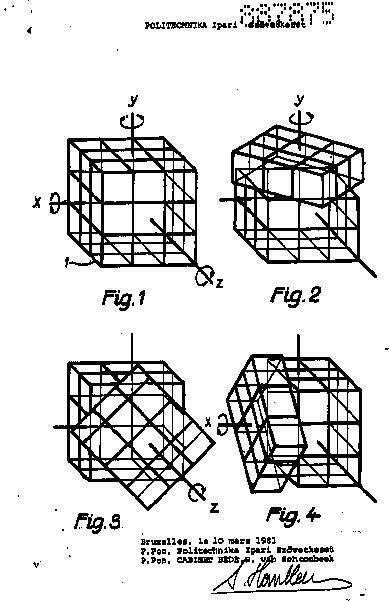 Comprising photodetecting means, e.g. cameras, photodiodes or infrared cells. For examples of the subject matter covered by this Indexing Code, see US2005208999, US6811492, JP7185131, JP2003010541, JP2004085524, JP2005230139. Details of the game device. Authorising game programs or game devices, e.g. checking authenticity of the recording medium. For examples of the subject matter covered by this Indexing Code, see US2007092118 (-), JP2007089732. Specially adapted for generating image data, e.g. circuitry for displaying objects on a television screen. For examples of the subject matter covered by this Indexing Code, see EP1585062, EP1469382, EP0553532, JP2005287756, JP2004318139, JP2003126550. 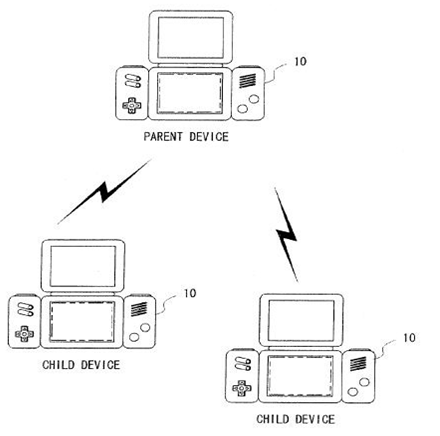 Game devices specially adapted to be portable, i.e. held in at least one hand while playing. For examples of the subject matter covered by this Indexing Code, see US6764400, US2002047237, JP10235014, JP2000051517. Using geographical information, e.g. location of the game device or player using GPS. For examples of the subject matter covered by this Indexing Code, see US2002063655 (-), JP2002159743. Storage medium specially adapted for storing game information, e.g. game cartridge. Involving loading game data from a removable recording medium, e.g. streaming from a DVD. For examples of the subject matter covered by this Indexing Code, see WO03032127 (p.8, l.16 - p.10, l.3), US6949023 (, , -), JP2005505362T, JP2000107455. Involving personal data of the player, e.g. player profile, personal settings. For examples of the subject matter covered by this Indexing Code, see US2003109312 (-), JP2001104646. Low level software layer, relating to hardware management, e.g. Operating System, API. For examples of the subject matter covered by this Indexing Code, see US2003154367 (-), US6672963 (abstract), JP2000047876. Output arrangements for game devices. Having at least one additional display device, e.g. on the game controller or outside a game booth. For examples of the subject matter covered by this Indexing Code, see US20070015577. Responding to control signals received from the game device for affecting ambient conditions, e.g. for vibrating player's seats, activating scent dispensers or affecting temperature or light. For examples of the subject matter covered by this Indexing Code, see EP0970730. Using indicators, e.g. showing the condition of a game character on screen. For examples of the subject matter covered by this Indexing Code, see US2007149266 (circular gauge, -, -), EP1787697 (showing tire load in driving game), JP2007167153. For graphically or textually suggesting an action, e.g. by displaying an arrow indicating a turn in a driving game. For examples of the subject matter covered by this Indexing Code, see US2007111768, JP2006031670, JP2002360921. For tagging game characters, game objects or locations in the game scene, e.g. displaying a circle under the character controlled by the player. For examples of the subject matter covered by this Indexing Code, see EP0844580 (marker at soccer player's feet, figure 7, claim 5), JP2006212423. For examples of the subject matter covered by this Indexing Code, see US2002006817 (soccer game shows 1 of 3 radars, -, -), JP11128538, JP2002210235. For prompting the player, e.g. by displaying a game menu. Interconnection arrangements between game servers and game devices; Interconnection arrangements between game devices; Interconnection arrangements between game servers. Communication aspects specific to video games, e.g. between several handheld game devices at close range. Between game devices with different hardware characteristics, e.g. hand-held game devices connectable to game consoles or arcade machines. Involving a wireless network, e.g. Bluetooth, Wi-Fi or piconet. Using wireless networks, e.g. cellular phone networks. Hardware details of game servers. Involving special game server arrangements, e.g. regional servers connected to a national server or a plurality of servers managing partitions of the game world. For examples of the subject matter covered by this Indexing Code, see EP1407803 (abstract, paragraphs ,,-, claim 1, fig 11). Particular local network, e.g. on a plane, in a train, in a hotel. For examples of the subject matter covered by this Indexing Code, see WO2006062641 (figure 1, claim). Using secure communication between game devices and game servers, e.g. by encrypting game data or authenticating players. For examples of the subject matter covered by this Indexing Code, see EP1519531 (abstract. 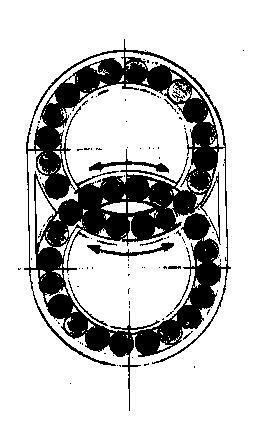 figures 5,6). Adapting the progress of the game according to the network or server load, e.g. for reducing latency due to different connection speeds between game clients. For examples of the subject matter covered by this Indexing Code, see WO02098526 (abstract, page 20: line 3 and following. Performing operations on behalf of game clients with restricted processing capabilities, e.g. game servers transform changing game scene into an MPEG-stream for transmitting to a mobile phone or a thin client. For examples of the subject matter covered by this Indexing Code, see WO03095050 (abstract, figure 2). For managing game device-related data or player-related data. For examples of the subject matter covered by this Indexing Code, see US6928414 (abstract, paragraphs ,, figure 3). For payment purposes, e.g. monthly subscriptions. For examples of the subject matter covered by this Indexing Code, see US2006168119 (abstract). Involving data related to game devices or game servers, e.g. configuration data, software version or amount of memory. For examples of the subject matter covered by this Indexing Code, see EP1291048 (abstract, figure 3, paragraph ). Saving the game status; Suspending or ending the game. For examples of the subject matter covered by this Indexing Code, see WO2004026425 (page1:line 20 through page 2:line 13, figures 2,4). Involving player-related data, e.g. identities, accounts, preferences or play histories. For examples of the subject matter covered by this Indexing Code, see EP1669117 (paragraph , figures 2,3). For finding other players, e.g. for matching opponents or building a team by skill level, geographical area, preferences, play style or for providing a buddy list. For examples of the subject matter covered by this Indexing Code, see US20030104868 (abstract, claim 1, figures 1,9). For examples of the subject matter covered by this Indexing Code, see WO2007010336 (abstract, paragraphs , , , , figures 1,2). For assessing skills or ranking players, e.g. for generating a hall of fame. For examples of the subject matter covered by this Indexing Code, see US 20040198495 (abstract, paragraphs ,,figures 1,4). Enforcing rules, e.g. detecting foul play or generating lists of cheating players. For examples of the subject matter covered by this Indexing Code, see WO2007109130 (abstract, figures 1,3,7). Providing additional services to players. Communicating with other players during game play, e.g. by e-mail or chat. For examples of the subject matter covered by this Indexing Code, see US6241612 (abstract, figure 3). Generating or modifying game content before or while executing the game program e.g. specific authoring tools for game development or game-integrated level editor. adapting content to different game platforms, using a scripting language to create content. By the player, e.g. authoring using a level editor. For examples of the subject matter covered by this Indexing Code, see US2001037181 (abstract, -), JP2001184525. Adaptively or by learning from player actions, e.g. skill level adjustment or by storing successful combat sequences for re-use. For offering mini-games in combination with main games, e.g. while loading the main game content. By mapping the input signals into game commands, e.g. mapping the displacement of a stylus on a touch screen to the steering angle of a virtual vehicle. For examples of the subject matter covered by this Indexing Code, see US2006252540 (, , , ), EP1125610 (claim 1), JP2006311966. Automatically for the purpose of assisting the player, e.g. automatic braking in a driving game. For examples of the subject matter covered by this Indexing Code, see US6764401 (abstract), US2003032466 (-, -), JP2001046742, JP2003053035. Involving acoustic input signals, e.g. by using the results of pitch or rhythm extraction or voice recognition. Involving acoustic signals, e.g. for simulating revolution-dependent engine sound in a driving game or reverberation against a virtual wall. By enabling or updating specific game elements, e.g. unlocking hidden features, items, levels or versions. Controlling the progress of the game. Involving branching, e.g. choosing one of several possible scenarios at a given point in time. For examples of the subject matter covered by this Indexing Code, see US2007010325 (, , , ), JP2007014457. Partially or entirely replaying previous game actions. Starting a game, e.g. waiting for other players to join a multiplayer session or activating a game device. Involving the timing of operations, e.g. performing an action within a time limit. Simulating properties, behaviour or motion of objects in the game world, e.g. 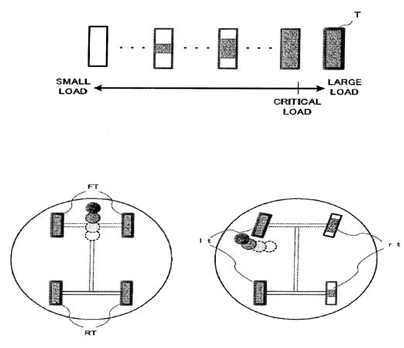 computing tyre load in a car race game . e.g. gravity direction is variable and depends on input signal. For examples of the subject matter covered by this Indexing Code, see US20090005139 (player-chosen gravity direction), US20060258448 (planet's gravity is controlled by player -), US20090325694 (switching between classical and quantum physics). Using determination of contact between game characters or game objects, e.g. to avoid collision between virtual racing cars. 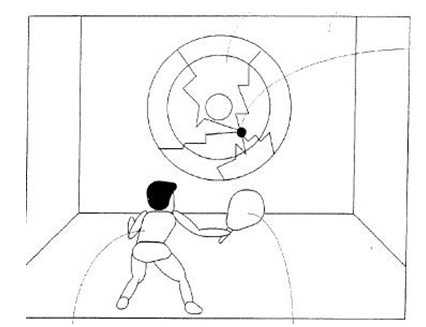 For examples of the subject matter covered by this Indexing Code, see US2003162592 (objects are glued when colliding, figure 2B, figure 8A, -), EP2216082 (size of contact area decreases if tennis player looses balance -), US2002024521. Using trajectories of game objects, e.g. of a golf ball according to the point of impact. For examples of the subject matter covered by this Indexing Code, see US20090051690 (NPC trajectory randomly chosen between 2+ curves), US20090118011 (drawn trajectory is analysed to suggest user input, claim 1). By computing conditions of game characters, e.g. stamina, strength, motivation or energy level. For examples of the subject matter covered by this Indexing Code, see US20030144045 (psychological pressure in basketball game). Involving aspects of the displayed game scene. instructing the image rendering of a game scene on the basis of game parameters; details of the rendering of the 3D game scene are classified in the corresponding function place G06T. For examples of the subject matter covered by this Indexing Code, see EP2000185 (NPC character is removed from scene if not in player character field of vision, , -), US20020198047 (2 game fields are displayed together, , , claim 1). Computing the motion of game characters with respect to other game characters, game objects or elements of the game scene, e.g. for simulating the behaviour of a group of virtual soldiers or for path finding. e.g. 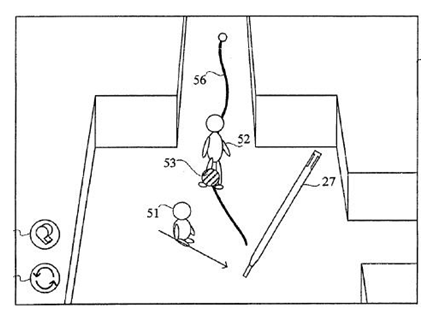 for controlling clone characters, for intercepting a soccer ball. For examples of the subject matter covered by this Indexing Code, see EP1228794 (2nd character automatically controlled or not), EP1586357 (clones in fixed configuration), EP1203603 (jump or push obstacle depending on speed), JP2005287757. Specially adapted to simulate their behaviour as a group, e.g. bird flock, school of fishes, military formation. Changing parameters of virtual cameras. For examples of the subject matter covered by this Indexing Code, see EP0990458. Using a plurality of virtual cameras concurrently or sequentially, e.g. automatically switching between fixed virtual cameras when a game character changes room or displaying a rear-mirror view in a car-driving game. For examples of the subject matter covered by this Indexing Code, see US2003027637 (switching cameras in fight game depending on hit count, claim 1). According to dedicated instructions from player, e.g. using a secondary joystick to rotate the virtual camera around the player's character. For examples of the subject matter covered by this Indexing Code, see US2006040740. For examples of the subject matter covered by this Indexing Code, see EP0933105 (distance between player's car and camera depends on obstacles, -). Using special effects, generally involving post-processing, e.g. blurring of rendered frames. For examples of the subject matter covered by this Indexing Code, see EP0948979, EP1744283, EP1170044, JP11272881, JP2005316926 and JP2002024857. Automatically by game devices or servers from real world data, e.g. measurement in live racing competition. game level is created from music data on a CD. For examples of the subject matter covered by this Indexing Code, see US2005219377 and JP2005284767. Special adaptations for executing a specific game genre or game mode. Athletic performances, e.g. track-and-field sports. Ball games, e.g. soccer or baseball. Driving vehicles or crafts, e.g. cars, airplanes, ships, robots or tanks. Characterised by a large display in a public venue, e.g. in a movie theatre, stadium or game arena. For examples of the subject matter covered by this Indexing Code, see US20060258457. Hand-to-hand fighting, e.g. martial arts competition. Gliding or sliding on surfaces, e.g. using skis, skates or boards. Using musical performances, e.g. by evaluating the player on the ability to follow a notation. Involving concurrently several players on the same game device, e.g. 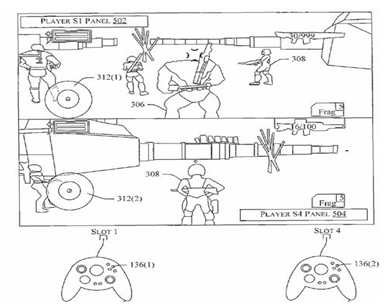 requiring the use of a plurality of controllers, of a split-screen or of a specific view of game data for each player.